On a recent football Saturday in downtown Ann Arbor, there’s a line of more than 50 people waiting for sandwiches. A Zingerman’s employee is at the door handing out menus and free samples of potato salad and other sides to whet the appetites of waiting customers. The small building holds a massive cheese and meat counter, and an impressive selection of foods from around the world: olive oils and balsamic vinegars; jams, honeys, and mustards from Germany and France; pasta from Italy; and chocolate from just about everywhere. From a modest start in 1982 in an old red brick grocery store in Ann Arbor’s historic Kerrytown neighborhood, the company founded by Ari Weinzweig and Paul Saginaw — thanks to a $20,000 second mortgage on Saginaw’s house and a $2,000 loan from Weinzweig’s grandmother — now has more than 500 employees in seven separate businesses, dubbed the Zingerman’s Community of Businesses. A big part of the program is training. Zingerman’s employees have to take classes and pass tests, and they can’t get benefits until they complete a lengthy orientation — typically in 60 days. “Some people do it in 30 days,” Weinzweig says. “Some people take three years.” They get awards for passing classes, as well. And the company looks to use anyone’s talents. A deli retail manager recently sent out an e-mail to workers congratulating a 16-year-old employee for being so talented that she’s training people. “She’s training people who are in their 20s, 30s, 40s,” Cook says. The company also rewards its employees in different ways. At the Roadhouse — because the restaurant did so well — management upped the employee discount last year from 20 to 30 percent. A few years ago, after Bakehouse employees performed well over an extended period and beat a series of annual goals to cut waste and accumulate savings, they received some $35,000 in bonuses. The employees are also eligible for regular profit-sharing, as well. A key to the company’s success is that each unit has a managing partner who owns part of that business. “They make the push to go for greatness,” Weinzweig says, and they operate as one business with “semiautonomous units.” One of those partners is Allen Leibowitz, who runs Zingerman’s Coffee Co. On a recent Saturday afternoon, Leibowitz was working the crowd at Whole Foods in Ann Arbor, offering customers samples of fresh-brewed java. Across the store, another Zingerman’s employee handed out samples of the company’s three handmade candy bars. Zingerman’s alumni have gone on to write books and start their own businesses, such as the Mercury Coffee Bar in Detroit’s Corktown neighborhood, founded by Todd Wickstrom, a one-time Zingerman’s managing partner. Another former employee launched a chocolate company. He enters the restaurant dressed in a Zingerman’s olive-oil T-shirt, carting a pile of books and a yellow legal pad with a lengthy, almost indecipherable to-do list. Tucked in the pages are spreadsheets with the company’s financial performance. He’s writing a book about bacon, following his best-selling Zingerman’s Guide to Good Eating, which was preceded by Zingerman’s Guide to Giving Great Service. Another book on business vision is up next. His advice to aspiring entrepreneurs: “Figure out a vision for your business — not a strategic plan,” he says. “It’s painting a picture of what success looks like. Zingerman’s isn’t shy about what may be its only drawback: its prices. It does charge $9.50 for 12 ounces of gelato, $24.95 for a large coffeecake, and some deli sandwiches top $13 — and, yep, all you get with it is a pickle. One reason customers keep coming back is that Zingerman’s is upfront about price fluctuations. When grain prices recently surged, the company tacked up empty sacks of flour with the rising prices and dates to highlight their increased costs. When pecans spiked in price, they posted letters explaining the price increase — and vowing to lower them when commodity prices declined. During our interview, Weinzweig never sits — dashing off on occasion to consult with a chef, greet a customer, or sample a dish. And he’s relieved he’s being recorded. It’s impossible, he says, to take notes as fast as he talks. The company is also keen on promotions and public relations. Inc. magazine has called Zingerman’s “the coolest small company in America.” Zagat’s 2006 survey called Zingerman’s “the best deli in America.” The late R.W. Apple Jr., who was a top food writer at The New York Times, once wrote, “Zingerman’s, the deli of my dreams, is unmatched outside New York.” NPR has called the company “an empire.” The company aims to become the best-known deli in the United States — and it seems like it’s well on its way. The University of Michigan Health System cites Zingerman’s numerous honors in wooing job candidates. Well-known chef Mario Batali is a big fan who has often dropped in to shop and eat, lavishing praise during his TV show. In May, Zingerman’s brought 400 hand-pulled, barbecued beef-brisket sandwiches for Oprah Winfrey and her studio audience to eat. “On a scale of 1 to 5,” Winfrey said, “11.” Why? “Because you can taste the molasses, and then there’s a twang.” That sent sales of the BBQ sandwich (No. 97) through the roof. Despite Michigan’s rocky economy, the privately held company recorded revenue of $35 million last year, up from $31 million the year before. Zingerman’s projects growth at 5 to 10 percent annually. Weinzweig says that they’re on pace to post $38 million in revenue for its fiscal year, ending July 30, 2009. The deli once known only around southeast Michigan for its heaping corned-beef sandwiches was quick to take on its suppliers. The second business it opened was a bakery, built in a business park near the Ann Arbor Airport in 1992 after the partners learned about the trade from New York baker Michael London. Today, the company sells a staggering 50,000 loaves a week, or about 2.6 million loaves a year, shipping thousands to customers around the country and selling bread to 140 grocery stores and other retail outlets. And quite a few sandwiches — 100,000 pounds of corned beef annually, and 500,000 pickles. The sandwiches are so popular, you can order four Reuben sandwiches via mail order for $120 (which includes overnight shipping, all the fixings, brownies — and pickles). Its mail-order business accounts for roughly 27 percent of the business ($10 million), and the company hires about 300 seasonal workers around Christmas to handle the holiday rush. The company’s reach is impressive — it has ventured into parts of the business it once outsourced to suppliers (bread, bagels, coffee, among others). Now it even offers classes for aspiring bakers (bakewithzing.com). Beyond baked goods such as croissants, muffins, and scones, seemingly no product is too difficult or too esoteric for Zingerman’s to make. The list includes wedding cakes, marshmallows, graham crackers, candy bars, and even hummus. It even has a Zingerman’s Creamery to make numerous types of cheese and gelato — and, of course, it uses local cows to provide the milk. It has a large catering business and also operates a small take-out place for coffee and pastries out of a 1952 Royal Spartanette aluminum trailer outside the Roadhouse. The vision statement has since been updated for 2020. The company now envisions between 12 and 18 businesses in the Ann Arbor area by 2020 and has considered myriad options, including a Spanish restaurant, a small hotel, microbrewery, and publishing firm, Weinzweig says. But despite the wild success of the deli and the other outlets, Zingerman’s doesn’t want to emulate once-small companies such as Borders (also from Ann Arbor), Starbucks, and McDonald’s, all of which grew into international behemoths. Zingerman’s is rooted in the community, he says, and its employees get to know its regular customers — something that would be lost if the company opened delis and other businesses across the country. The company is committed to its hometown, although it nearly branched out to the next county. Before 2001, it considered an offer to open a location at Metro Airport. “We spent a lot of time agonizing over whether that fit the vision,” Weinzweig says. But ultimately, the deal was scrapped. Zingerman’s even declined another recent offer to open at the airport. The newest business in the works is Cornman Farms. The company, launched in 2005 by Roadhouse chef Alex Young, began as a garden behind his Dexter house. At the outset, he grew tomatoes and a few other vegetables for the restaurant. Now it’s blossomed into a three-acre farm that harvested about 30,000 pounds of tomatoes (40 different varieties) and 10,000 pounds of peppers this summer as part of a “Dirt to Plate philosophy,” quickly getting food from farm to restaurant. Cornman also planted basil, garlic, squash (nine different kinds), heirloom potatoes, cucumbers, onions, beets, radishes, turnips, salad greens, and beans. Chef Young is even raising chickens. In the last 10 years, zingermans.com sales to businesses have grown 20-fold. 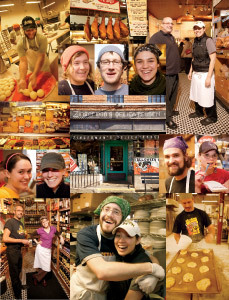 Zingerman’s has 22 training seminars scheduled this year and averages about 23 people in each. That number represents only the people who come to Ann Arbor for the scheduled seminars. ZingTrain reaches much more than that with consultations and custom seminars across the country.